Where did it all go wrong for Yahoo? It used to be your search engine. So what happened? 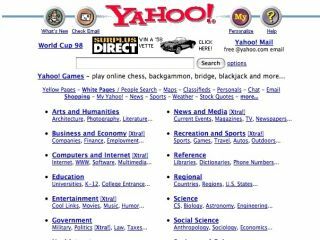 Yahoo made the web work: by finding interesting things online and breaking them into categories, it was the place most of us started our online adventures. Now, though, it's a shadow of its former self, and when we search, we Google. So how did Yahoo mess it up? Of course, Yahoo is still an enormous company, the web's biggest portal and home to all kinds of good services such as Flickr and Yahoo News. But just look at the numbers. In January 2000, Yahoo shares were nearly $120 each. Now they're under $15, while Google's are $379. Yahoo is currently worth around $19 billion, compared to nearly $120 billion for Google. There's no doubt that in search, Google pulled the rug out from under Yahoo. Yahoo was first and foremost a directory, but other search engines offered search rather than browsing - and by the early 2000s, it seemed that search ads, not display ads, would be the next big thing in advertising income. Recognising this, Yahoo decided to take on Google. It bought search company Inktomi, Google's closest rival, in 2002, and it bought search advertising firm Overture in 2003. All Yahoo needed to do was to put them together and integrate them with its existing search system. And that's where the wheels came off. Integrating Inktomi took some time - it wasn't fully integrated until early 2004 - but that was nothing compared to the problems with Overture. Because Overture was wildly profitable - and because its biggest customer after Yahoo was Microsoft - Yahoo didn't want to mess with it too much, and that led to the ridiculous situation where Yahoo salespeople competed against Yahoo-owned Overture sales people for ad sales. Project Panama, which would use Overture to make Yahoo's search advertising platform a real rival to Google, wasn't finished until 2007. As Business Week reported in December 2006, with Panama still in development Google was already eclipsing Yahoo's revenues - in the first nine months of 2006 it raked in just over seven billion dollars in ad revenue compared to Yahoo's 4 billion - and while Yahoo was concentrating largely on search ads, its rivals were making cash from other areas such as social networking. Yahoo, though, was focused on Google - to the point where, according to former Yahoo sales boss Wenda Millard, "Yahoo lost sight of who they are and who their customers are." Speaking to the DeSilva+Phillips media summit in 2008, she said: "Yahoo's perception is that their only competitor is Google. But 95 percent of their revenue comes from advertising, so their competitors are really in the broadcast TV networks. They think they're in the search game, when they should be in the brand advertising game." It's hard to succeed in business when you don't know what business you're actually in. One key criticism of Yahoo is that it bought companies with the zeal of a Russian billionaire's wife let loose in Harrods - Wikipedia lists 56 acquisitions - without any clear strategy. When Flickr's Stewart Butterfield resigned in 2008, his amusing resignation letter contained some sharp criticisms of the firm. Butterfield compared Yahoo to a sheet-tin manufacturer that expanded into rubber, computing, real estate, brewing, consumer finance, lighting, salty snacks, hotels, casinos, weapons, ships and oil exploration. "I don't know what you and the other executives have planned for this company, but I know that my ability to contribute has dwindled to near-nothing, and not entirely because of my advancing age," Butterfield wrote. Greg Sterling is the founder of Sterling Market Intelligence and Contributing Editor at Search Engine Land. "In fairness to Yahoo, some of that stuff was going on at Google and Microsoft, although perhaps to a lesser degree," he says. "There was a culture a couple of years ago of highly competitive bidding, and nobody really knew what services were going to be necessary or strategic. These companies were essentially trying to outmanoeuvre their competitors and grab the asset, the hot new company or the feature or tool that might turn into something meaningful for users or advertisers. "I do think Yahoo and some of its competitors were being short-sighted and irrational, and weren't doing acquisitions with a coherent strategy. It was very like real estate speculation, with people bidding irrationally because there was so much competition."